BlackBerry has been more than willing to tell you about most of the smartphones coming down its pipeline, but it hasn't been very clear about when they'll show up. 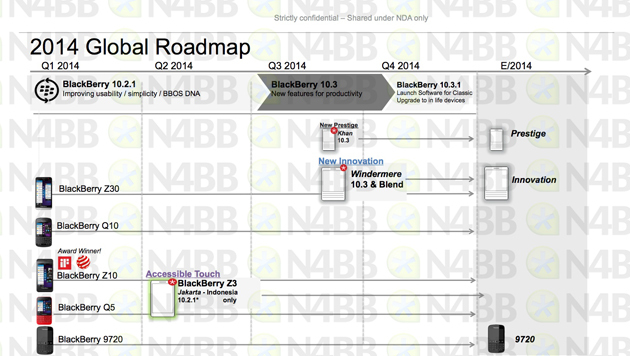 There aren't many mysteries left now, though: N4BB has posted a roadmap (below) revealing most of what's happening in the remainder of 2014, as well as how the devices are positioned. Both the wacky, squarish Passport ("Windermere") and the luxurious Porsche Design P'9983 ("Khan") are tentatively slated to arrive near the end of the third quarter, or around September. They'll represent the "innovation" and "prestige" models, respectively. There's no mention of the Classic or a leaked Z3 with LTE, although the timetable has the Classic launching with a BlackBerry 10.3 update (10.3.1) due in the fourth quarter. You'll have to be patient if you prefer that old-school BlackBerry feel, in other words. The roadmap is also notable for what's not making the cut. While we knew that many existing BlackBerry devices weren't long for this world, it now looks like all but the Z3 and legacy 9720 will be gone by the end of this year. If you've been jonesing for a Z30 or Q10, you'd better act quickly -- they'll be museum pieces within a few months.